Neuroblastoma is the most common extracranial solid tumor of childhood. The most common primary site is the retroperitoneum and approximately 60% of patients have metastases in bone, bone marrow, lymph nodes, and liver. In spite of hematogenous spread of the disease, it rarely metastasizes to the lung or brain. Much of the literature is available mainly on the primary neuroblastoma of abdomen (retroperitoneum) with its staging system, treatment options, and prognosis. However, literature is sparse when it comes to primary central nervous system (CNS) neuroblastoma. Only few case series and isolated case reports are available in the literature.,,, We describe two patients with primary intracranial neuroblastoma [Table 1]. Although the first was purely intraventricular (bilateral lateral ventricles), the second was in right parieto-occipital area. Both the patients underwent surgical decompression. A 7-year-old girl presented to emergency department with a history of headache and vomiting since 3 months. On examination, the child was conscious and oriented. Fundus showed bilateral papilledema. She did not have any other focal neurological deficit. Imaging revealed a large intraventricular lesion involving the bilateral lateral ventricle and enhancing on contrast [Figure 1]. The child underwent right frontal craniotomy, middle frontal gyrus approach, and gross total decompression of the lesion. Lesion was friable with significant vascularity. External ventricular drain was placed at the end of the surgery. Histopathology showed fragments of cellular tumor composed of sheets and lobules of round cells separated by vascular septa. The cells had fine chromatin to hyperchromatic nuclei. Mitosis and apoptosis were increased. Homer Wright rosettes were seen. Immunohistochemistry showed diffuse positivity for synaptophysin [Figure 2]. Glial fibrillary acidic protein (GFAP) highlighted reactive astrocytes. Tumor was negative for epithelial membrane antigen (EMA) and LIN28A. MIB-1 labeling was high (40%–50%). INI-1 showed retained expression. The child developed venous infarct postoperatively and did not regain normal consciousness. She underwent tracheostomy and was weaned off the ventilator within a week. She required ventriculoperitoneal shunt 2 weeks after surgery. Need for adjuvant therapy was explained to the parents; however, in view of poor prognosis, they refused for further adjuvant treatment at our institute. At the time of discharge, the child was E4, V tracheostomy, M5. 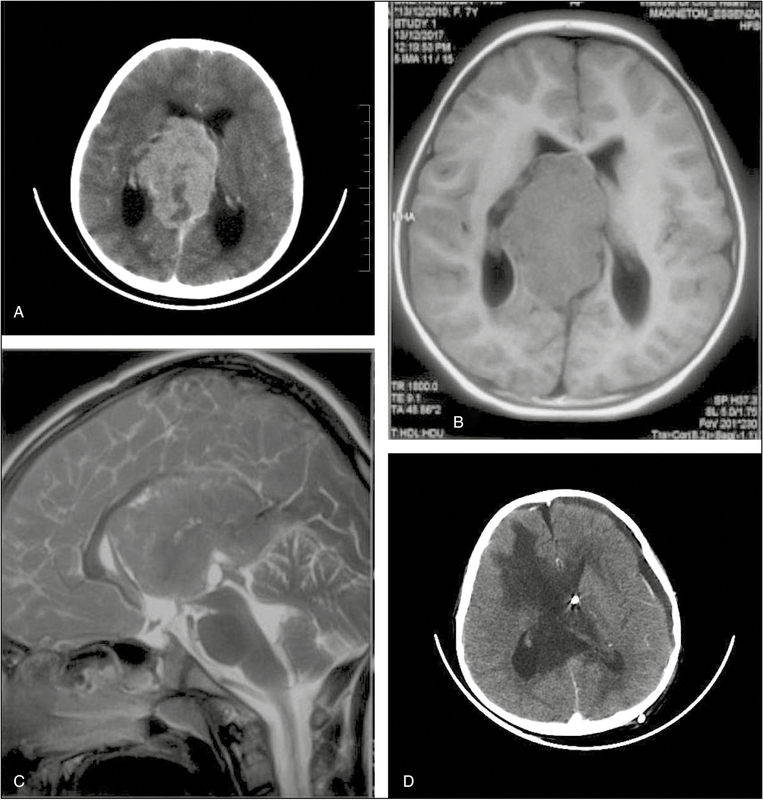 A 12-year-old boy presented with raised intracranial pressure of 6-month duration along with one episode of generalized tonic–clonic seizure. He was drowsy but obeying simple verbal commands. Examination of the fundus revealed papilledema. No obvious focal neurological deficit was observed. Imaging revealed a large right-sided parieto-occipital homogenously contrast-enhancing lesion with significant mass effect, midline shift to left side with uncal herniation [Figure 3]. The child underwent emergency right parieto-occipital craniotomy and gross total decompression of the lesion. Lesion was firm and vascular without definite plane with normal brain parenchyma. Histopathology showed infiltrating high-grade neoplasm that comprised round cells with clear cytoplasm arranged in sheets, lobules, and nests, separated by a fibrovascular septa. Background showed fine neuropil-like stroma. Cells showed significant nuclear pleomorphism and atypia. Frequent binucleation and multinucleation of cells were noted with brisk mitosis. At places, the fibrovascular septa was hyalinized and showed calcification. Microvascular proliferation and micronecrosis were noted. Adjacent infiltrating zones showed perineuronal satellitosis and perivascular infiltration. On immunohistochemistry examination, tumor was positive for synaptophysin and negative for GFAP, EMA, and LIN28A with retained expression of INI-1 [Figure 4]. Postoperative course was uneventful and the child had good recovery. This patient also required a ventriculoperitoneal shunt 1 month after primary surgery for hydrocephalus. At the time of discharge, the child was ambulatory without any focal deficit. The patient was lost to follow-up after discharge. Primary CNS neuroblastoma was often categorized under primitive neuroectodermal tumors, although this was controversial. Russell and Rubinstein stated that the above group of neuroectodermal tumors combines a histologically inhomogeneous lesions as if they were pathologically indistinguishable. The primitive neuroectodermal tumor group included a wide range of tumors such as medulloblastoma, ependymoblastoma, medulloepithelioma, neuroblastoma, spongioblastoma, and pineoblastoma. Horten and Rubinstein, however, suggested that primary cerebral neuroblastoma is a distinct entity and it has few characteristic features: (a) tumor is usually highly cellular having neuronal origin and no glial differentiation, (b) the presence of a fine fibrillary matrix of axonal material, (c) sometimes it differentiates to mature ganglion cells, and (d) the frequent presence of well-formed Homer Wright rosettes. Neurosecretory granules that were seen on electron microscopy helped in a precise diagnosis. As far imaging features are concerned, no pathognomonic appearances are observed on computed tomography (CT) or magnetic resonance imaging (MRI) scan. Cystic changes or calcification can be seen in some patients; however, exact data for the same are not available in the literature because of the rarity of the disease. It should be considered in the differential diagnosis of intraventricular or periventricular masses, especially in the pediatric age group. In our case, tumor was homogenously hyperdense on plain CT scan and it was enhancing on contrast. On MRI T1-weighted sequence, lesion was uniformly hypointense and on T2-weighted sequence, it was predominantly hyperintense with few areas of cystic changes within the lesion. Neuroblastoma was not considered in the differential diagnosis for any of our patients. Our working diagnosis was neurocytoma or germ cell tumor in the first child, having purely intraventricular lesion, and supratentorial ependymoma in the second child with parenchymal involvement. In our study, histopathological confirmation was required for definitive diagnosis. After obtaining the diagnosis of neuroblastoma, abdomen and thoracic CT was carried out to look for the common site of this disease. However, both were within normal limits in both the children. We could not see the final outcome of the disease as the first patient refused treatment and second patient was lost to follow-up after shunt surgery. No standard guidelines are available for the adjuvant treatment in case of primary CNS neuroblastoma. Chemotherapy with or without radiotherapy is offered based on the age of the patient. Bennett and Rubinstein, in their study, had stated that because of the high incidence of local recurrence and the relative frequency of cerebrospinal metastasis, prophylactic whole brain and spinal irradiation is probably justified. Adjuvant radiotherapy to entire neuraxis has also been suggested by Horten and Rubinstein. Berger et al., however, stated that spinal radiation should be reserved only to those showing evidence of disease by cerebrospinal fluid analysis or myelogram. 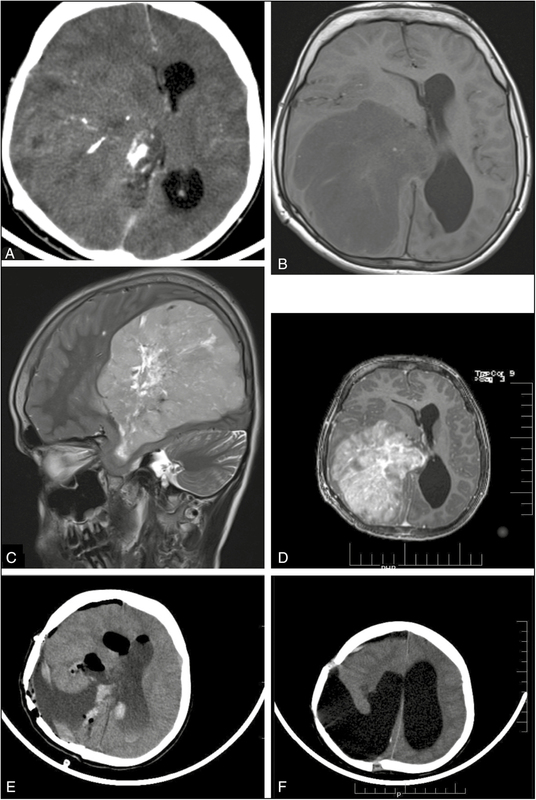 Primary cerebral neuroblastoma is a very rare and aggressive tumor with a relatively poor prognosis because of local tumor recurrence as well as leptomeningeal seeding. Primary intracranial neuroblastoma is a rare disease with high chances of local recurrence. It carries a grave prognosis because of its aggressive nature. Preoperative diagnosis based on imaging is quite difficult. It should be kept in the mind as one of the differential diagnosis in pediatric age group. Aggressive surgical resection followed by adjuvant chemotherapy/radiation appears to be the best treatment option at present. Grovas A, Fremgen A, Rauck A, Ruymann FB, Hutchinson CL, Winchester DP, et al. The National Cancer Data Base report on patterns of childhood cancers in the United States. Cancer 1997;13:2321-32. DuBois SG, Kalika Y, Lukens JN, Brodeur GM, Seeger RC, Atkinson JB, et al. Metastatic sites in stage IV and IVS neuroblastoma correlate with age, tumor biology, and survival. J Pediatr Hematol Oncol 1999;13:181-9. Burchill SA, Lewis IJ, Abrams KR, Riley R, Imeson J, Pearson AD, et al. 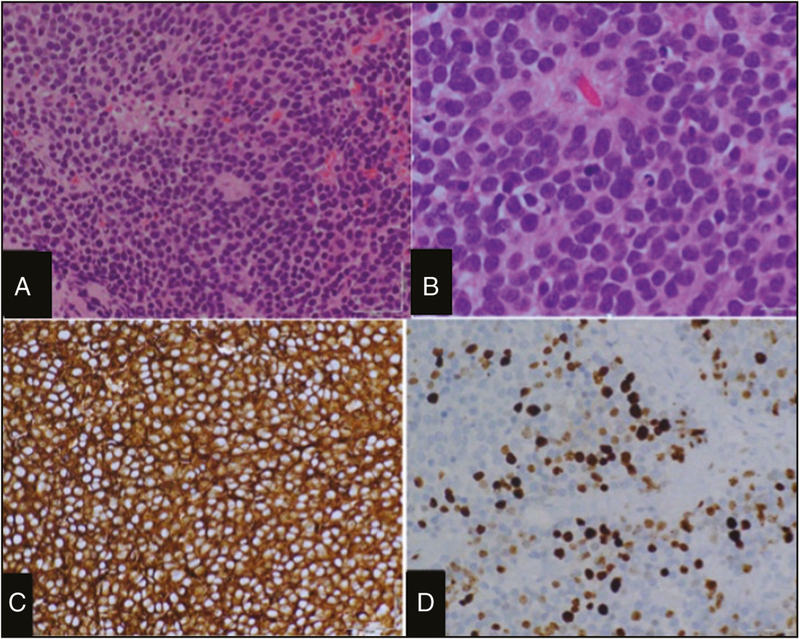 Circulating neuroblastoma cells detected by reverse transcriptase polymerase chain reaction for tyrosine hydroxylase mRNA are an independent poor prognostic indicator in stage 4 neuroblastoma in children over 1 year. J Clin Oncol 2001;13:1795-801. Cowie F, Corbett R, Pinkerton CR. Lung involvement in neuroblastoma: incidence and characteristics. Med Pediatr Oncol 1997;13:429-32. Matthay KK, Brisse H, Couanet D, Couturier J, Bénard J, Mosseri V, et al. Central nervous system metastases in neuroblastoma: radiologic, clinical, and biologic features in 23 patients. Cancer 2003;13:155-65. Davis PC, Wichman RD, Takei Y, Hoffman JC Jr. Primary cerebral neuroblastoma: CT and MR findings in 12 cases. AJNR 1990;13:115-20. Horten BC, Rubinstein LJ. Primary cerebral neuroblastoma. A clinicopathological study of 35 cases. Brain 1976;13:735-56. Bennett JP Jr., Rubinstein LJ. The biological behavior of primary cerebral neuroblastoma: a reappraisal of the clinical course in a series of 70 cases. Ann Neurol 1984;13:21-7. Berger MS, Edwards MSB, Wara WM, Levln VA, Wilson CB. Primary cerebral neuroblastoma long-term follow-up review and therapeutic guidelines. J Neurosurg 1983;13:418-23. Russell OS, Rubinstein LJ. Pathology of tumors of the nervous system. 5th ed. Baltimore, MD: Williams & Wilkins; 1989. pp. 279-89. McComb RD, Burger PC. 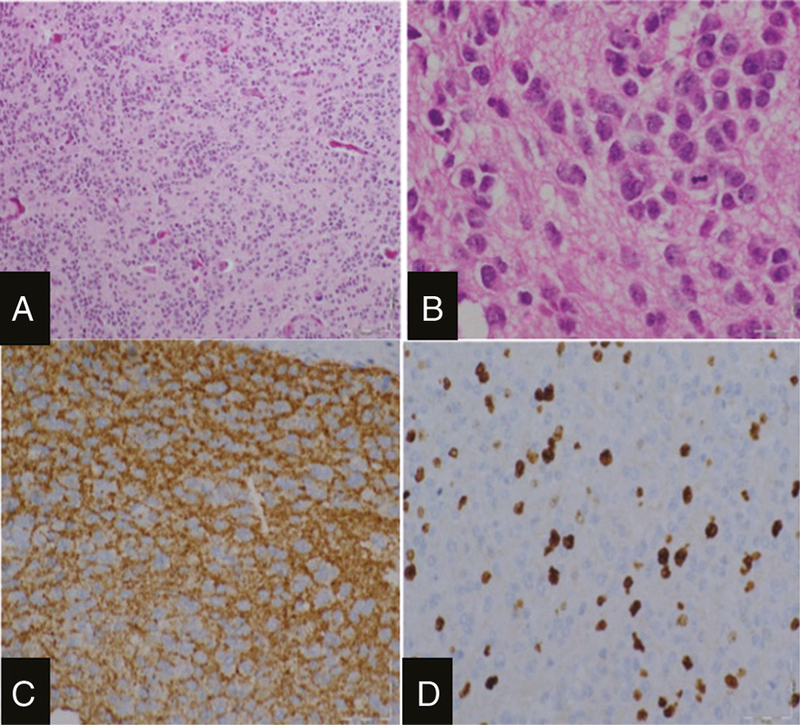 Pathologic analysis of primary brain tumors. Neurol Clin 1985;13:711-28. Zulch KJ. Brain tumors: their biology and pathology. 3rd ed. Berlin, Germany: Springer Verlag; 1986. pp. 301-6.